It is December and the temperature is starting to drop significantly. How does this drop in temperature affect your feet? My patients will generally notice increase dryness and cracking of their feet. This generally can be treated with lotions and creams, but if not treated can lead to larger cracking called fissures and even open wounds/ulcers. The most important thing during this cold weather is to practice preventative medicine and to utilize lotions and or creams to enhance your skin’s moisture. What is a good lotion to use on your feet? I usually recommend and prescribe ammonium lactate cream for very dry skin. If there is associated itchiness and redness this could be a combination of athlete’s foot and dry skin, so an antifungal cream would be a good addition as well. Some people can notice bluish discoloration to their toes due to the cold weather and pain. This can be due to a condition called Raynaud’s disease. 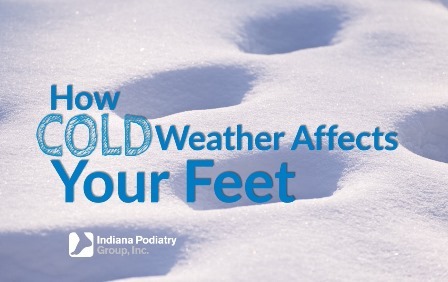 You should establish care with your nearest IPG podiatrist if you are experiencing any of these issues during the winter months. Stay warm.